Brachiosaurs from the RareResource website. Announcement by Laboratory News, 30 March 2012. Video summary with Brian J Ford, 30 March 2012. The original article in Laboratory News 3 April 2012. Report from Newscore on Fox News, 3 April 2012. Tamara Cohen in the Daily Mail on-line, 3 April 2012. Account by Lizz Team Pick, Autostraddle, 3 April 2012. Hannah Furness, Daily Telegraph on-line, 3 April 2012. Summary released by the Newstrack India news portal. Report by James Waldron, TNT Magazine, 3 April 2012. B S Akshaya, International Business Times, 3 April 2012. Kevin Spak report in the Newser, 3 April 2012. News World Digest web site, 3 April 2012. Sonia Elks reports in Metro, 3 April 2012. On-line 9-MSN news report, 4 April 2012. Rachel Allen, Cambridge Times, 4 April 2012. Report in East Africa Enquire Today, 4 April 2012. Report for Sky News Australia, 4 April 2012. News report for Herald Sun, 4 April 2012. Update by Newstrack India, 5 April 2012. Interviewed by BBC Five Live, 0635-0640h, 3 April. Breakfast Show, ABC, Canberra, Australia, 2045-2055h. Report Saurier waren Amphibien in German magazine P.M. Welt des Wissens, 13 April. 'Critical Focus' article Aquatic Dinosaurs under the Lens in December 2012.
Letters (for and against) aquatic dinosaurs published in The Microscope. Australian report: Swimming dinosaurs (2013). Indian report: Swimming dinosaurs (2013). London: Swimming T. rex (2013). USA report: Additional substantiation for swimming T. rex (National Geographic). Diet of dinosaurs: Fish in spinosaurs summary. Update: see Brian J Ford, 2014, Die-Hard Dinosaurs, Mensa Magazine, March 2014: 10-14. Blog in June 2014 moving towards the aquatic dinosaur hypothesis. Conventional images of dinosaurs always show them pounding about on dry land, usually on sun-baked mudflats or arid deserts. Often (as above) they are shown near water - but the new theory shows that dinosaurs must have evolved under the contsraints of an aquatic environment. The theory advanced in this paper is that the massive body weight of dinosaurs was supported by buoyancy - they evolved, not as land animals, but as primarily aquatic creatures. Many have in the past been depicted as resting in swamps, though as essentiall terrestrial creatures. This new theory proposes that they developed specifically in an aquatic environment and the fossil evidence, including the most recent findings, is held fully to support this view. 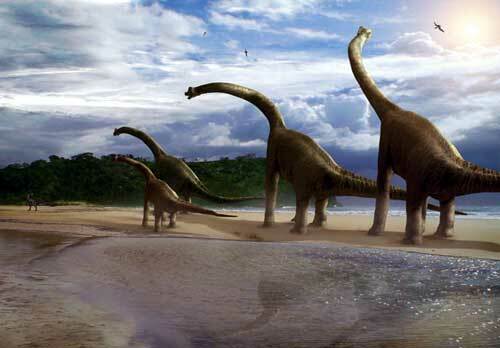 "I propose that the Sauropoda and other large dinosaurs were not land-dwelling at all; they essentially aquatic. They spent their lives browsing in shallow lakes, their tails being supported - not by wasteful metabolic expenditure by being held aloft - but by the buoyancy of lakewater. "The geology of the era matches exactly what I now propose. In Wales and elsewhere we have huge lias deposits and near my home there are vast clay beds hundreds of feet deep as reminders of the huge shallow lakes that existed for millions of years; where as in the USA we have the Morrison Formation - at least 1,600,000 km2 of those rocks in the USA alone. Reinterpreting the geological findings has given me endless substantiation for my view. Those strata are all siltstone, mudstone, limestone and sandstone; they are sedimentary and are the legacy of the of vast shallow lakes I now propose. "The accepted interpretation as 'flood plains' is unsatisfactory. "In the Morrison strata you have the huge sauropod fossils throughout these beds; all are characterized by elongated necks and high body mass. The conventional interpretation is for seasonal lakes with grazing dinosaurs at the periphery; I argue that the body mass is unsustainable and conclude instead that the dinosaurs evolved as essentially aquatic genera walking on the mud at the bottom of enduring shallow lakes. The mass of their bodies, being of neutral density, was borne by the surrounding water rather than by the limbs; and wherever you see reconstructions it seems clear to me (as a biologist) that the drawings and models make far more sense if – in the mind’s eye – one envisions them being largely immersed in water. The theory also accounts for the shallowness of the fossil footprints (the vast mass of sauropoda would have led to them becoming entrapped in alluvial mud were they walking on land). "It also answers one of the main metabolic controversies - dinosaurs seem to have the properties of homoeothermic organisms, yet all the reptilia are poikilothermic; according to my theory, their immersion in lakes provides the thermal buffer an an aquatic environment. The fact that the mean water temperature was about 37'C is a further supportive factor. They could thus have the metabolic constancy of endotherms coupled with ectotherm physiology ..."
Further details will be posted above as further publications and presentations appear.